Scanty Armenian language and absence of national musical traditions encouraged Armenians to steal Azerbaijani musical heritage. Armenian appropriation of Azerbaijani music is continuing nowadays. They stole many samples of Azerbaijani folklore and classical tunes to create their own art. Armenian writer and philosopher Mikael Nalbandyan wrote in a book that "most of the melodies and songs have been borrowed from the Turks [Azerbaijanis]". The book, titled "About ancient verses and songs", says, "I have been to many places where the Armenians live, and I have always tried to hear something Armenian. Unfortunately, I could not. The names of all musical instruments that we use -- saz, santur, kamancha -- are all Turkic." Another Armenian classical writer, Abovyan, noted that "the Armenians sing only in Turkic" and "the Armenians have not got their own eposes with songs." Azerbaijani professor Kamran Imanov says it is hard to find a manuscript dating back to the 17-18th centuries. "The absolute majority of the Armenian folk songs are based on Azerbaijani songs," he said. "For instance, the Azerbaijani folk dance tunes "Uzundere" and "Jeyrani", written at the end of the 19th century, were declared to be primordially Armenian several years thereafter. The same was done with the popular Azerbaijani dance tune "Shalakho", as in the Musical Encyclopedic Dictionary (1959) it was presented as "an Armenian solo dance." The most impudent theft of Azerbaijani music is the song "Sari Gelin", which is translated as "yellow bride". Its "Armenian" version is titled "Es kez tesa". Prof. Imanov said that the Armenians introduced this musical masterpiece in a European music collection as an Armenian song. The meaning of the title "Sari Gelin", which every Azerbaijani understands, remained unknown for Armenian plagiarists. Another example of Armenian theft is the most ancient Azerbaijani folklore art, mugham. We cannot but mention what kind of tricks were used by the Armenians to leave their "name" in the musical art of the Azerbaijani mugham. It was difficult "to armenianize" this kind of musical folklore. 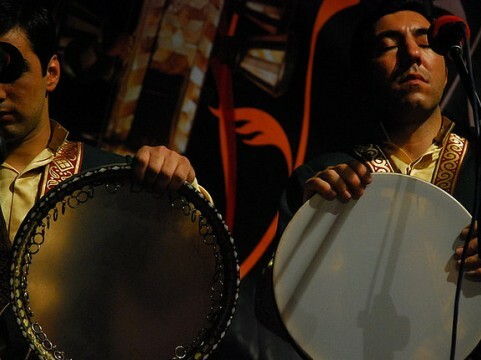 Mugham is a special art born at the resonance of poetry of the language and its melodiousness with the music of mugham. It is impossible to sing mugham without ghazals, gasides, rubais -- in a nutshell, Oriental poetry. Unfortunately, the creations of great Azerbaijani composer and founder of the national classical music, Uzeyir Hajibeyov, were also a victim of Armenian thieves. Hajibeyov created the world-famous musical comedy "Arshin mal alan" ("The Cloth Peddler") in 1913. As soon as "The Cloth Peddler" appeared on the Armenian stage, Magalyan, who played tar, an Azerbaijani musical instrument, set the fashion for such theft. Magalyan staged "The Cloth Peddler" in Armenian for the first time in the Avlabar region in Tbilisi, in the Eriksian theater. In his book "Tall Armenian tales: a guide to the 'art' of heritage thievery", Prof. Imanov wrote, "In 1915 the musical comedy "The Cloth Peddler" was performed in Armenian, and thus the foundation for its misappropriation was laid. Since the first performance in Tbilisi in 1915 until 1921 the company of Magalyan contrived to stage the comedy 800 times, including 200 times in Georgia, twice in Russia and once in Istanbul, Turkey. The Armenian companies made changes in the operetta and also made intentional distortions in the comedy." This is just a minute part of the Armenian appropriation of Azerbaijani musical heritage. The list of stolen items includes a lot of tunes and operettas. Stealing Azerbaijani art, they completely ignored their own creations. Armenians continue to live amidst falsehood created by themselves.